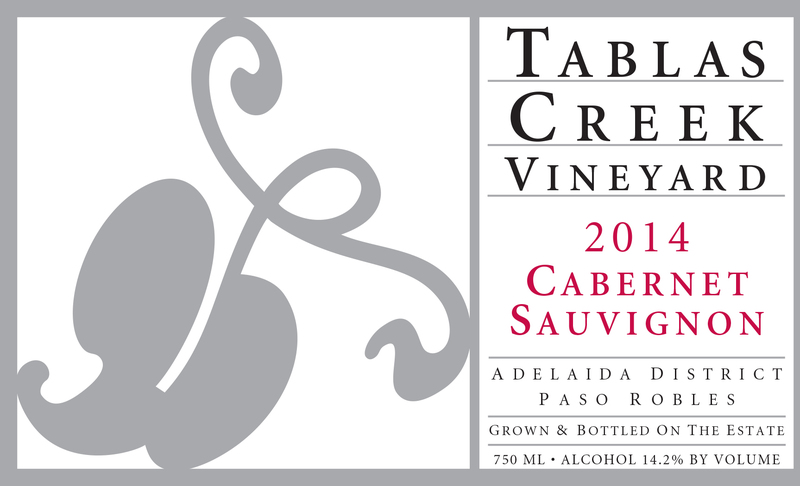 The Tablas Creek Vineyard Cabernet Sauvignon 2014 is Tablas Creek's third varietal bottling of this renowned grape, famous for the wines in makes in Bordeaux and many regions around the New World. The 2014 Cabernet Sauvignon is absolutely immediately identifiable as cabernet on the nose: tobacco, blackberry, dark chocolate, juniper and mint. The mouth is perfectly balanced between sweeter cocoa powder and black fruit and more savory elements of cigar box and eucalyptus. There is nice acidity on the finish tying everything together and keeping it fresh. After importing our Châteauneuf du Pape clones, we brought in selections of a few other high quality (non-Rhone) clones as part of an effort to expand our nursery business. Although we eventually decided that our nursery should remain focused solely on the Rhone grape varieties we grow, we had already planted a few small increase blocks of these other grapes. The Cabernet Sauvignon we've harvested has in past years been co-fermented with our Tannat (a traditional partner in the Basque country where it is from) but in 2014 we were so taken with our Cabernet that we kept separate the two barrels we had and bottled 60 cases. Our Cabernet Sauvignon grapes are grown on our certified organic estate vineyard. The 2014 vintage was our third consecutive drought year and saw our earliest-ever beginning to the growing season. The summer was warm but without serious heat spikes, and our coolest August in a decade slowed ripening at a critical period. When it warmed back up in September, the fruit tumbled in, and we finished in mid-October, about two weeks earlier than normal. The result was a vintage with excellent concentration balanced by good freshness, which should be vibrant and powerful young, but with the balance to age. The Cabernet Sauvignon was harvested on Sepbember 26th. The grapes were fermented in a one-ton microfermenter using native yeasts. After pressing, the wine was moved into two 60-gallon barrels: one new American oak barrel and one three-year-old French oak barrel, for a balance of oak characteristics and elegance. The wines stayed on their lees, stirred occasionally, for a year and a half before they were blended and bottled in April 2016.